When I was coming up with a title for this post, I vascillated between spain in a bowl and adventures in charcuterie. I opted for the former, primarily because the adventures in charcuterie were not entirely my own, AND I was so excited by this dish (and also the charcuterie) that I wanted to make sure more people read the post. I figured a lot of people would be put off by the idea of making their own ham. So I'll preface the recipe by saying that you could make this with ANY ham or pork. 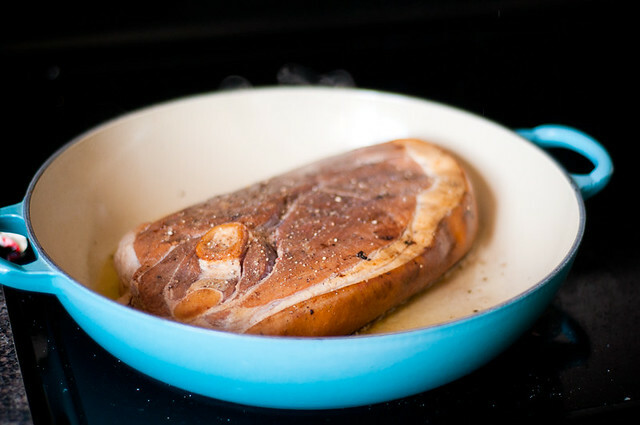 Good quality is better, but with all the delicious seasoning, even with run of the mill ham, I think it would still be pretty awesome (though probably salty; definitely go easy on the salt). The road that led us to our ham (and BACON! )-making adventures did not come altogether honestly. Frankly, last year, we ordered 1/4 pig from a local farmer. And the pork has been delicious, but we were left with a number of cuts (side pork, ham hocks, ham steaks, ham roasts) where we weren't really sure what to do. They were uncured/brined and unsmoked, so we decided that they needed some sort of processing to get them to a point where we would want to eat them. Hubs is braver than I in this respect, so he just bit the bullet and brined them for a few days (fairly simple brine - salt, sugar, bay leaves, spices, etc.). And a kind foodie co-worker of his smoked them for us. The result? Meat that makes your house smell like a firepit. It's epic. So aside from a decent stockpile of bacon, I also had this large slab of 'ham steak' (bone-in) and a couple of ham hocks. I wasn't really sure what to do with it, but I came across this recipe on epicurious, and I thought it sounded like a great place to start. And it was. I will say that the dish was probably improved by the sheer deliciousness of my ham, but the flavours are so rich and wonderful. This is a three-part dish, definitely something you'd want to make on a weekend. I'd definitely serve this to guests, though I'd have to make sure they were non-picky meat-eaters. 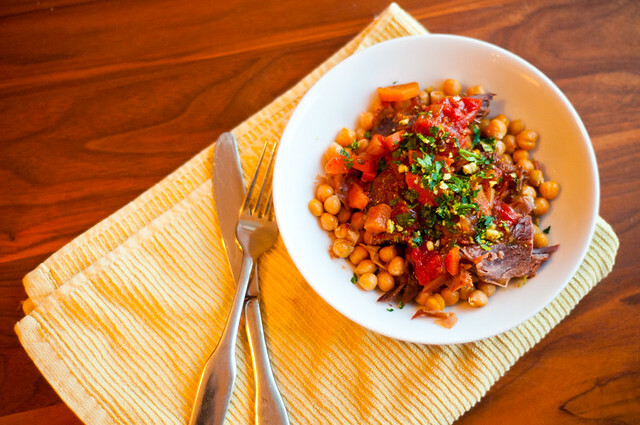 The ham was braised in a smokey, rich tomato broth with a touch of sherry, served over chickpeas sauteed with saffron, garlic and minced prosciutto, and topped with an almond-orange-parsley gremolata. I loved it. 1. Preheat oven to 250°F. Sprinkle ham/pork shanks and ham hock, if using, with salt and pepper (TIP: if using commercial ham, no salt; it's salty enough!). 2. Heat oil in heavy wide pot over medium-high heat. Working in batches, sauté ham and hock until brown, about 5-6 minutes per batch; transfer to platter/plate. 3. Add carrots, onion, garlic, and thyme to pot. Sauté until onion softens, about 5 minutes. 4. Add coarsely chopped tomatoes with juice, broth, Sherry, chiles, tomato paste, chili powder, paprika, cumin, and coriander. Bring to boil, scraping up browned bits from pan bottom. 5. Return ham and hock, if using, to pot. Return to boil. Cover pot and place in oven. Braise until ham is tender, about 3-4 hours (note: if using commercial ham, yours will be tender from the get-go; so you can just cook for about 1-2 hours). Tilt pot; carefully spoon off all fat. 1. 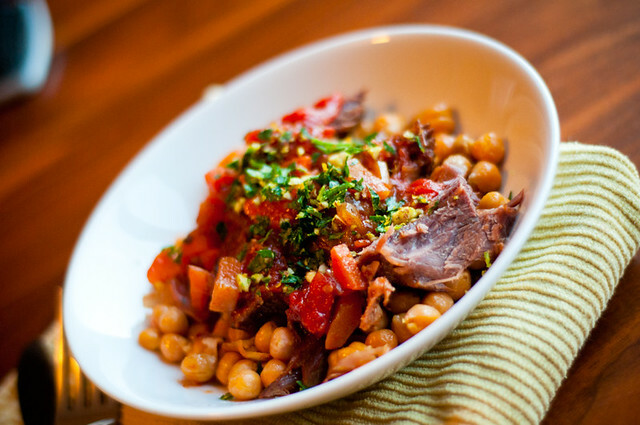 While pork/ham is reducing on the stove-top, make garbanzo beans and gremolata: Heat oil in medium skillet over medium-low heat. 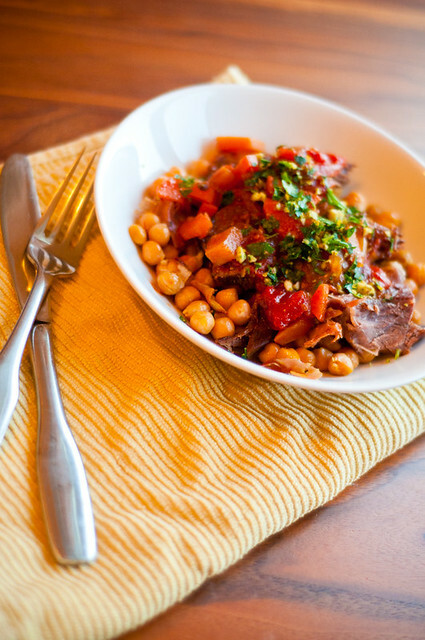 Add chickpeas, garlic, and saffron and prosciutto. Sauté until heated through, about 5 minutes. Sprinkle beans with salt and pepper (I found the canned beans and prosciutto had enough salt on their own). 2. 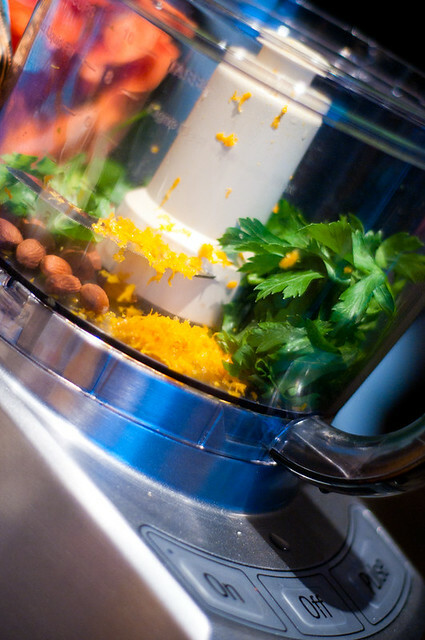 Mix parsley, almonds, and orange peel in small bowl for gremolata; I'm lazy, I did mine all in the food processor. 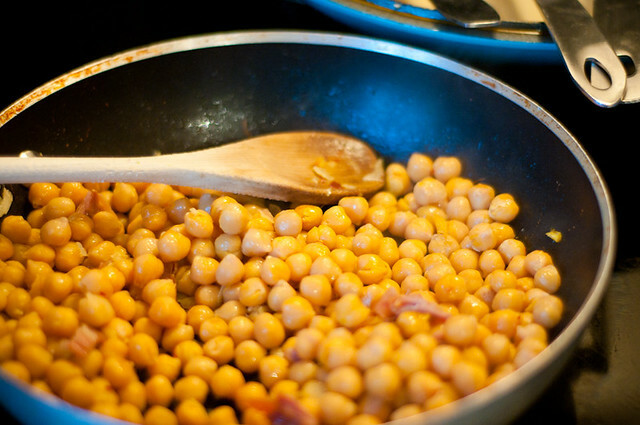 Place chickpeas in bottom of shallow bowl. 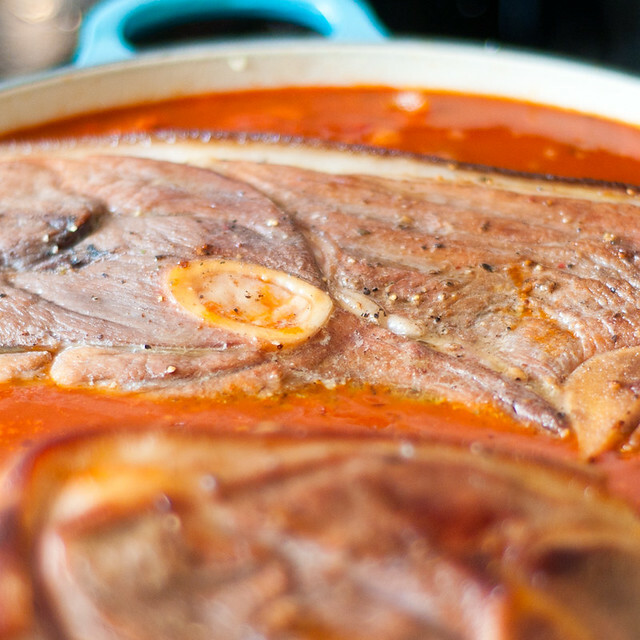 Top with chunk of ham/pork, spoon sauce over top and sprinkle with gremolata. 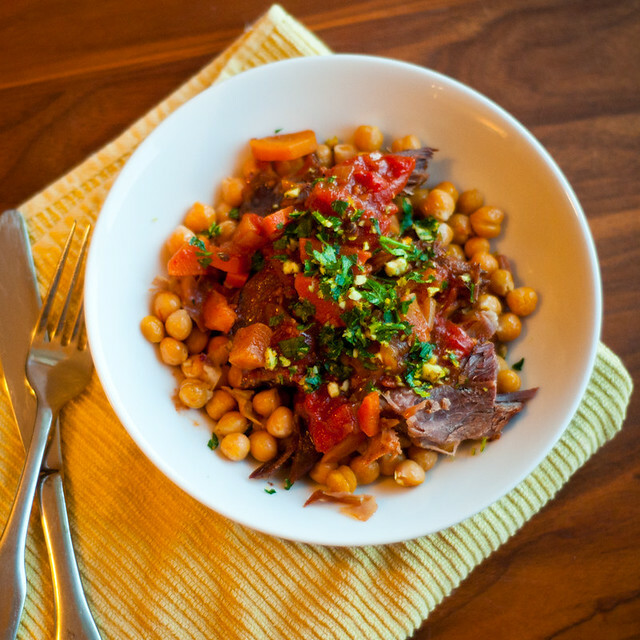 I just love the contrast in richness in this dish - rich, meaty pork, luscious saffron chickpeas, and then the bright crunch of the gremolata. It smells like Spain and I think it's a pretty fabulous tribute to Spanish cooking.